There are many ways that Caritas Latin America and the Caribbean ensures that the wealth that accumulates in the hands of the very few is shared. We support women in a way that they’re empowered to help their communities, their families and themselves, we have a strong voice in human rights which speaks out against the injustices which afflict our continent. 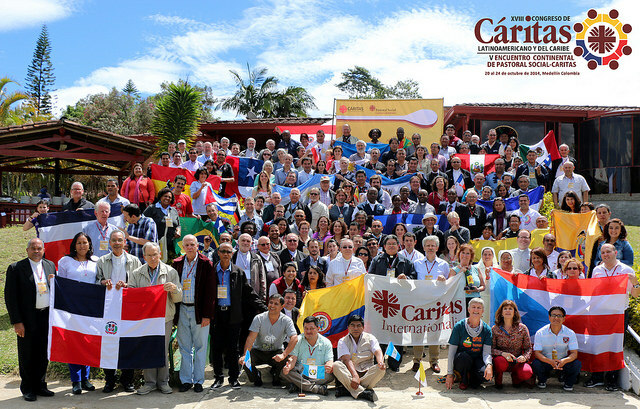 People from all 22 Caritas organisations from Latin America and the Caribbean gather together every four years, that is why we’re here in Colombia this week. We elect the president of the region and the regional coordinator. We also plan the road ahead: how we can work better together, how we can better live out our faith and be the true expression of a church which is serves the poor above all things and is full of compassion and which offers a path full of joy and hope? Our meeting has its spiritual roots in Pope Francis’s Apostolic Exhortation Evangelii Gaudium. Along with the Holy father, we dream “of a ‘missionary option’, that is, a missionary impulse capable of transforming everything, so that the Church’s customs, ways of doing things, times and schedules, language and structures can be suitably channelled for the evangelisation of today’s world rather than for her self-preservation.” (Evangelii Gaudium 27). Our continent is facing many challenges to which we must respond. The economic crisis is making the gap between rich and poor even bigger. How do we create another economic model which is based on solidarity rather than competition? Like many other places in the world, our continent is suffering from high unemployment. Even when people do have jobs, they often don’t have job and social security. There is also a growing digital divide, with many people without access to computers or internet and without the skills to benefit from the digital world. Many countries, especially in Central America are facing increasing violence and a prevalence of gangs and drug traffickers who tear at the social fabric. This instability has led to terrible suffering and forced many people, often children, to flee. There is growing corruption. There is also a weakening of the ideologies that would normally inspire political parties. Things are more improvised and parties ride on a wave of populism. The question is, how do we promote values and respect for human dignity in such a climate? Caritas organisations in Latina America are strongly rooted in faith and we are closely inter-connected in our work and our vision of a brighter future for everyone. We work as one to respond to the needs of the people and we support each other in this work. We value and promote people’s cultures when we work in communities. We help them recognise their strengths and we work with these strengths. We help communities identify opportunities for development and provide them with what they need to make this happen. There is a strong spirituality to our work and our Caritas staff in Latin American countries work with great joy and conviction. We recognise that people and communities have the ability to transform themselves when they are shown love and when we offer our commitment towards creating a more dignified life, greater access to justice and a focus on the common good. Caritas can’t be everything, but with the heart of solidarity which beats so strongly in Latin America, we can help people be something.